Fieldpoint is an enterprise field service management solution designed to drive efficiency and productivity, boost revenue and achieve and maintain customer satisfaction. The platform allows mid sized to large organizations to automate, manage, track, and maximize their field service processes and operations. With its own native field service mobile app, field technicians, subcontractors and service managers are able to access data online and offline. Furthermore, the software simplifies and streamlines the management of work orders, contracts, warranties, parts, as well as the scheduling of mobile resources for companies dealing with high volume of calls. Fieldpoint can be deployed as a cloud-based solution or on-premise. Its integrations with popular and widely used CRM systems, inventory, billing, accounting and other back-office systems ensure that users are able to enjoy and utilize end-to-end service management. 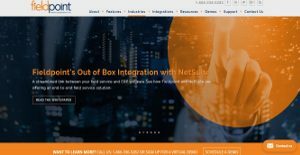 Fieldpoint also has out of box integrations with Microsoft Dynamics GP, NetSuite, Intacct and other prominent ERP systems. Likewise, it has a business intelligence module that helps create reports and dashboards by drilling down into key metrics and giving senior management the right data and performance measurements to make better business decisions. Fieldpoint’s Field Service Management Solution is designed for enterprises in such a way that it covers all bases of your operations from both ends, enabling you to be in full control over your work orders, scheduling and dispatch, resources, and more. Available as a cloud-based software or on-premise, Fieldpoint gives you all the tools you need to meet all your operational goals, accelerate the influx of cash, and drive more revenues for your business. Built for the field service industry, Fieldpoint Field Service Management software is ideal for businesses providing HVAC and refrigeration services, IT services, facilities management, oil and gas, medical devices, fire and life safety, and security systems among others. With advanced reporting and business intelligence capabilities, enterprises have access to accurate performance metrics to align strategies and goals. Aside from streamlining and simplifying work orders, Fieldpoint also makes scheduling and dispatching easy. Its drag-and-drop calendar console allows for quick and easy routing of calls and orders to field technicians based on their proximity, availability, skills, territory, and more. The software also comes with a contract management functionality that allows you to keep close and productive relationships with your clients. And when you have to expand your operations, managing third-party service providers and subcontractors is easy with its subcontractor management feature. Its mobile field service app empowers field technicians and subcontractors to become more productive and efficient as they can access necessary customer data, parts and resources, so they can provide high-quality service at every instance, capture and store information, provide customers with task details, a checklist for inspection and maintenance, and many more. It's important to keep in mind that virtually no software in the Field Service Management Software - FSM category is going to be an ideal solution that can meet all the requirements of different company types, sizes and industries. It may be a good idea to read a few FieldPoint reviews first as some solutions may perform well only in a really narrow set of applications or be created with a really specific industry in mind. Others might operate with a goal of being simple and intuitive and therefore lack advanced elements welcomed by more experienced users. There are also apps that cater to a large group of users and provide a powerful feature base, however that frequently comes at a more expensive price of such a service. Ensure you're aware of your needs so that you get a software that has all the features you search for. How Much Does FieldPoint Cost? Contact FieldPoint for enterprise pricing information and other product details. You can also submit a request for a demo to see if the software is a perfect fit for your business. We realize that when you make a decision to buy Field Service Management Software - FSM it’s important not only to see how experts evaluate it in their reviews, but also to find out if the real people and companies that buy it are actually satisfied with the product. That’s why we’ve created our behavior-based Customer Satisfaction Algorithm™ that gathers customer reviews, comments and FieldPoint reviews across a wide range of social media sites. The data is then presented in an easy to digest form showing how many people had positive and negative experience with FieldPoint. With that information at hand you should be equipped to make an informed buying decision that you won’t regret. What are FieldPoint pricing details? What integrations are available for FieldPoint? If you need more information about FieldPoint or you simply have a question let us know what you need and we’ll forward your request directly to the vendor.